Before I met you, I was already in love with you. I heard from friends and learned from blog entries like this that you are an unspoiled paradise of powdery white sands and crystal clear waters, quiet and uncrowded, just like Boracay before its commercialization. And when I finally went to see you last weekend, I fell in love all over again. 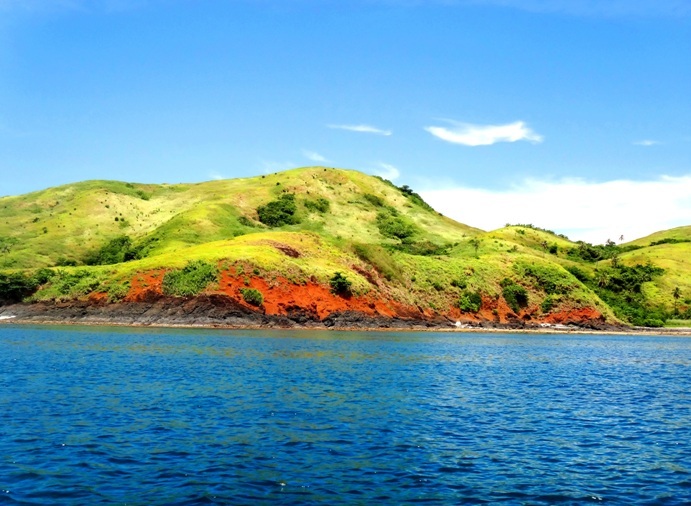 Even before I saw your famed stretch of white beach, you treated me to an expanse of rolling green hills punctuated by blazing red hills and dark rock formations. And as the boatman steered me and my companions to Mahabang Buhangin, I realized that you are as postcard-perfect as I saw you in photos – waters so clear they reflect the blue of the sky, and pure white sands. True, you are not as uncrowded as I expected – I now saw several boats docked on your shore and groups of people setting up camp. Still, your sands are large enough for each of us to have our own spot of paradise. And yes, though your shoreline is not as long as I expected – your “long beach,” is just around a kilometer or less – I was still smitten with you. And, for people like me who love walking barefoot on the beach, your powder-fine sands are just perfect. I was more than happy to rough it – camping on the sand and bathing in an outdoor common area – if it meant a weekend of paradise. Yes, there was an island fee we had to pay, but I believed that if it would be used to maintain your beauty and help the livelihood of your people, the Php 75 fee was worth it. But then, in the middle of Mahabang Buhangin, I learned the island fee was Php170, and I wondered why, though I saw their cottages there looked more developed than the makeshift ones we had at our area, near the end of your stretch of white sand. Anyway, I was happy to stay where we were, where the white sand ended as soon as a dark grey cliff blanketed with a jewel green forest rose to the sky. Exploring the foot of this cliff, I was surprised to find that what I thought were rocks from a distance were actually a garden of corals. And though I did not find Nemo, I saw fish of different colors. 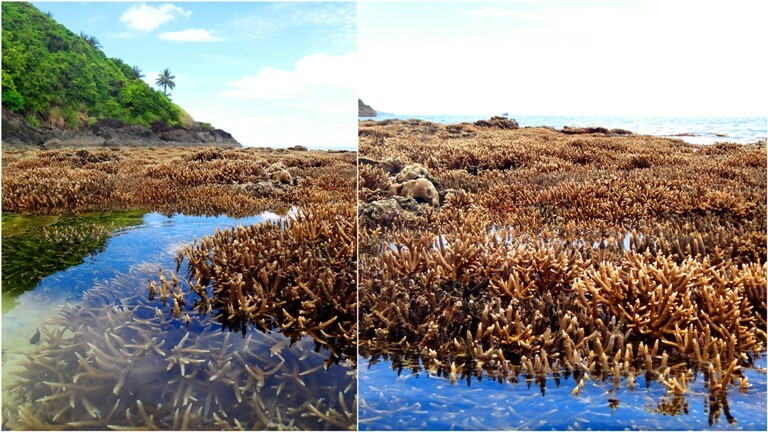 At low tide, there was no need to snorkel or use an underwater camera to take photos. Again, I felt like I was in an isolated paradise. 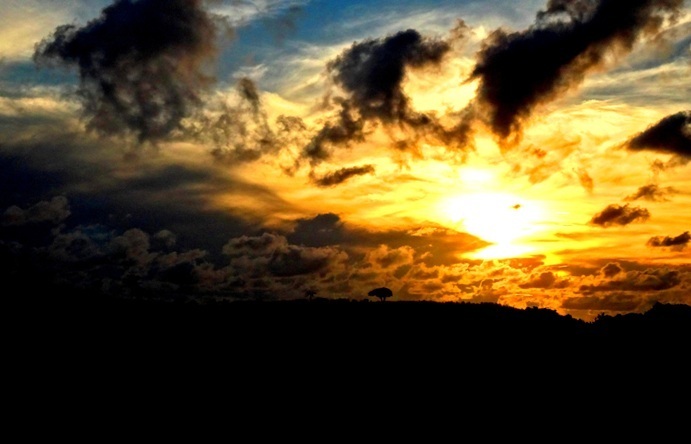 Also, as long as the skies are clear, you promise both breathtaking sunrises and sunsets. I realized that either is more picturesque when viewed from one of your hilltops. And, when I got the chance to talk to your people, I was smitten too. They remind me of the warm, friendly locals I met at Higatangan and Olotayan, also islands with beautiful beaches. They seemed like honest, hardworking people who took time off to talk to me and my travel companions. For your people, life seemed slow and laidback. At night, though, you broke my heart. Instead of the quiet unspoiled beaches usually offer, loud music kept blaring at your shore. 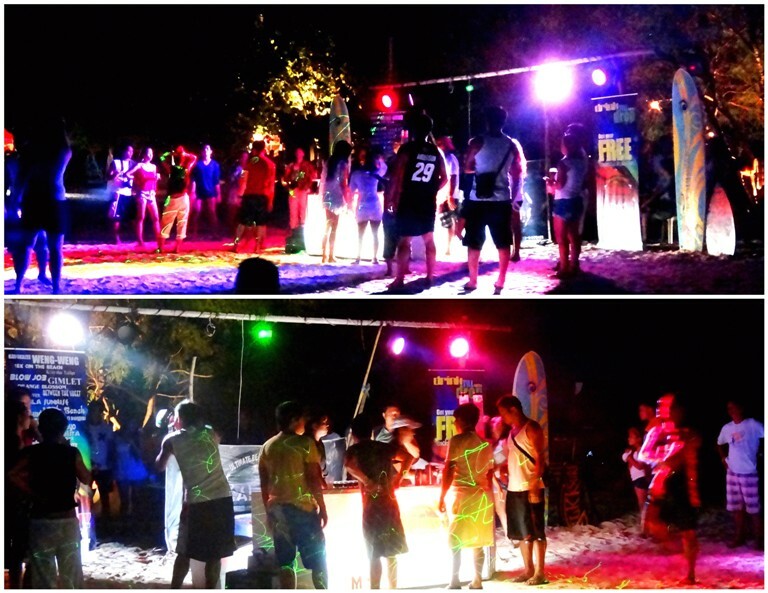 And when my travel companions and I went to the middle of the beach to see, we found, to our shock, a beach party in full swing much like in Boracay – a mobile bar offering an array of booze, blinking colored lights, and fire dancers. At another spot there was an audience listening in rapt attention as they were taught the finer points of mixing cocktails. And, when we looked up at the sky, we saw paper lanterns flying dangerously close to the forested cliff. And, we had a difficult time sleeping as fireworks kept flying and falling in the sky. One felt like it even fell close to our tent. 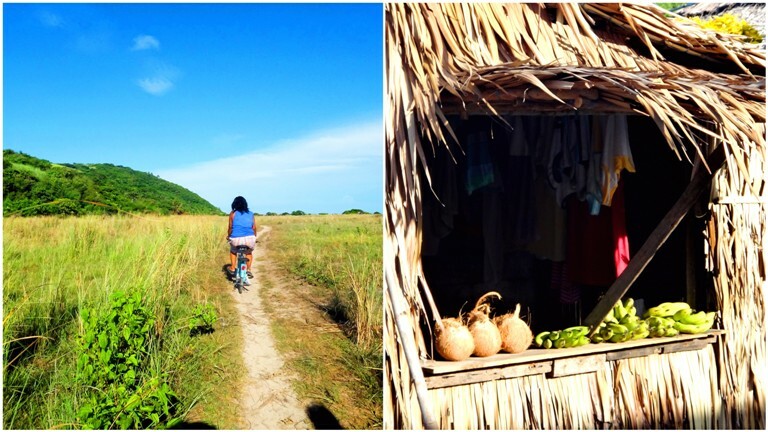 Calaguas, you are no longer the unspoiled paradise I read about and fell in love with. Thankfully, the kagawad in your Barangay Mangcawayan graciously listened to my concerns and answered my questions even in the middle of his Sunday morning errands. However, my apprehensions only grew. First off, whether Mahabang Buhangin visitors pay Php 75 or Php 170, only Php 20 goes to the barangay to help maintain the beach. And, at the moment, while the barangay officials agree that the ideal scenario is that all Mahabang Buhangin visitors pay the same island fee, they have yet to implement an ordinance for it. They also have yet no ordinance regarding noise and the use of fireworks, though Kagawad Raul assured me that they will work on it when I told him about the fireworks exploding near the shore. Unfortunately, Kagawad Raul said they do not get income from the visiting mobile bars, fire dancers, or any of the people coming in to organize similar activities. They just get the Php 20 share from the island fee. In fact, they are not always informed if there are such activities. 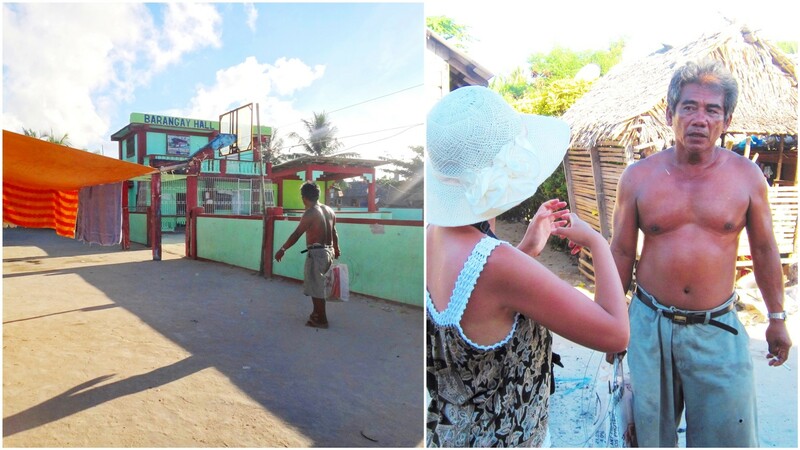 People organizing activities in the island are not required to get a permit from the barangay. When I asked him straight if the barangay plans to develop Mahabang Buhangin like Boracay, though, he said they do not see hotels and commercial establishments in Calaguas’ future. Cottages and simple accommodations would be enough. I am not assured, though, as the barangay seems to have not much control over what people and private businesses do in Calaguas, judging from my conversation with Kagawad Raul. Calaguas, I know I may not be able to stop you from going the way of Boracay, but my fervent wish is that should that happen, the money you bring in would most benefit your kind and gentle people, not just profit-oriented businesses. 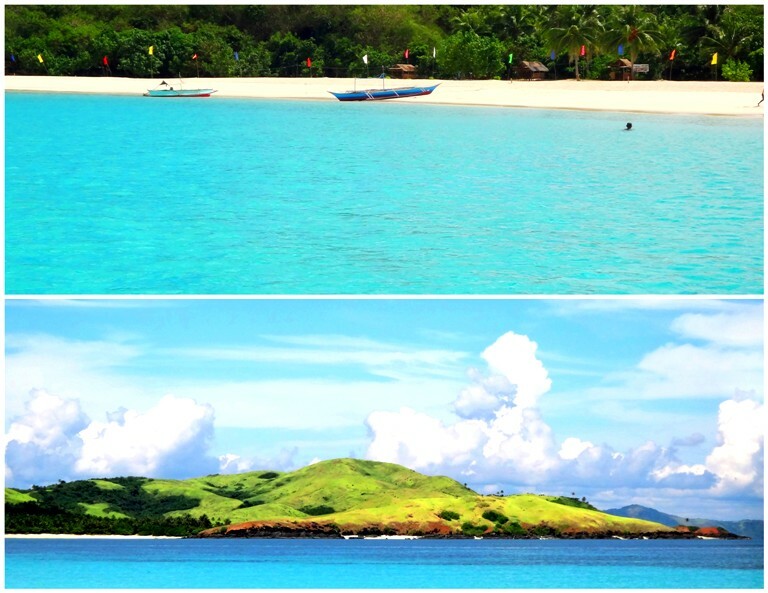 Calaguas, I still love you, but I do not plan to have a reunion with you anytime soon. Maybe if I do I will go on a weekday as I heard the beach parties there are just usually on weekends. Or maybe I will go to your other islands, not at Mahabang Buhangin. I heard that the few islands the people I know visited are not as powder-fine, though. Yes, you are still beautiful, but you are no longer the beach of my dreams. 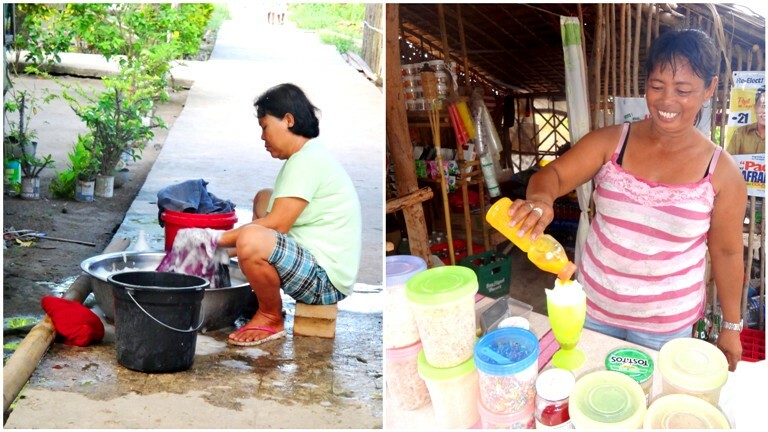 NOTE: What I learned about Mahabang Buhangin issues (island fees, agreement – or lack thereof – of activities in the island) is based only on a conversation with Kagawad Raul and a few other locals. I invite travelers to dig deeper into the story. My friends almost got burnt to a crisp two years ago when a stray firework landed a few inches away from their tent. Imagine if the firework landed on the tent. It would have caught fire in mere seconds, even before my friends could get the chance to wake up. Tsk tsk. That’s horrible! I didn’t know there were already fireworks two years ago. The barangay officials should really step up if they want to protect the beach and its visitors. I actually suggested to the kagawad to put a sign on what is prohibited in the beach (e.g. fireworks). I hope they do that or something similar to address this concern. Agree, Jun! I also “secretly” wish the same thing. 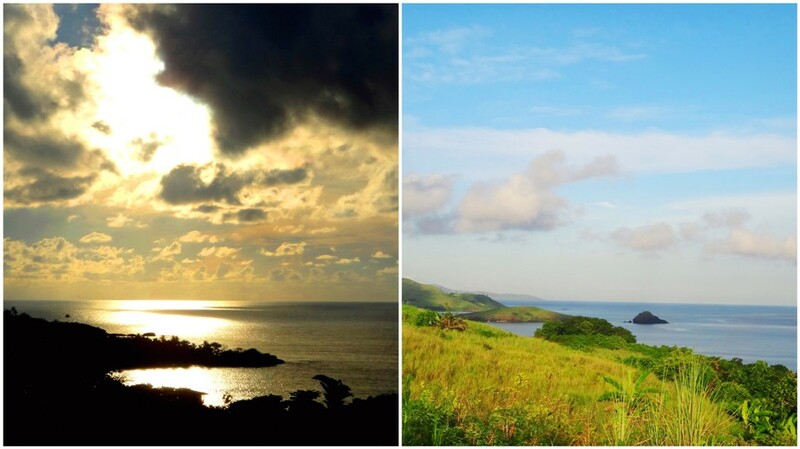 My parents fell in love in Batanes, and I hope to go there with them one day and let them tell me their love story. But I hope Batanes natives will have cheap airfare, different from tourist rates. Here’s more bad news for Basco flights. Look how cheap those are! I’m happy, but then, beware the throng of, I’m not sure how to call them. Let’s call them tourists. 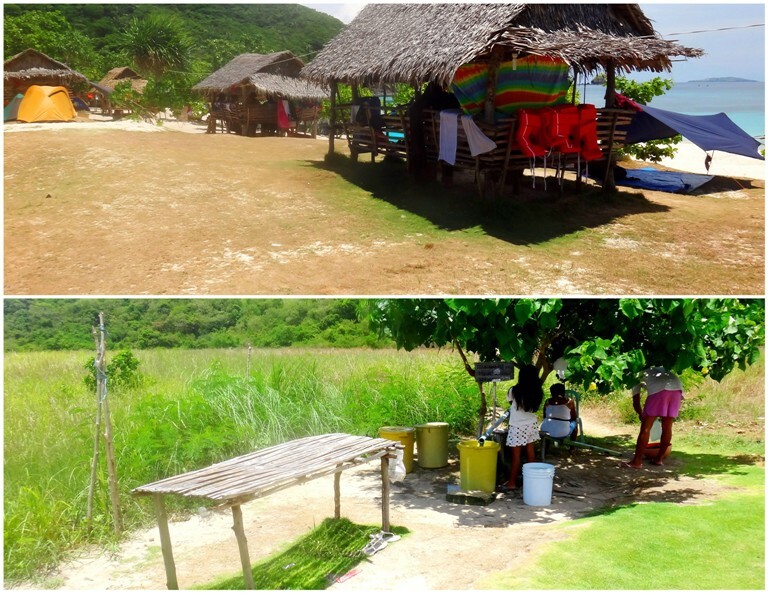 I too heard that Calaguas is really like a simple and humble paradise – unspoiled–through readings some blogs. Even photos made so eager to visit this place. If this place will no longer as unspoiled and unexploited, ordinary people will no longer can afford to pay an entrance fee controlled by greed establishments. 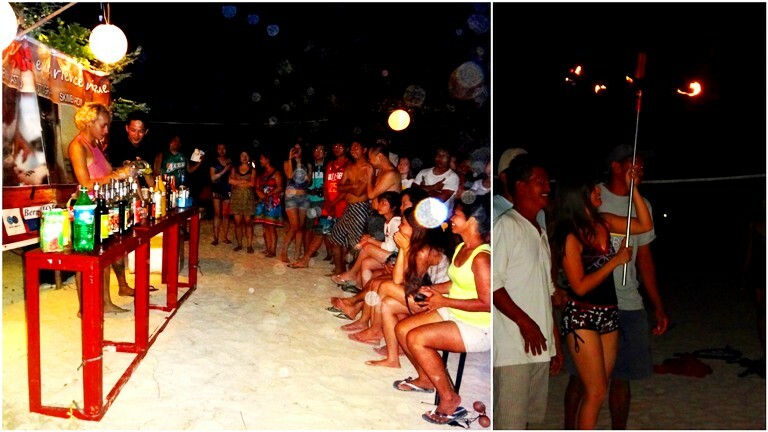 Like in Gumasa, you will pay an entrance of P150 per person just to see the natural beauty of white sand beaches. Dadating ang panahon wala ng easement of view or freedom to view our beautiful beautiful dahil lahat ay may entrance na na napakamahal. Ok lang yong P70 basta sa mabuting kamay mapupunta. 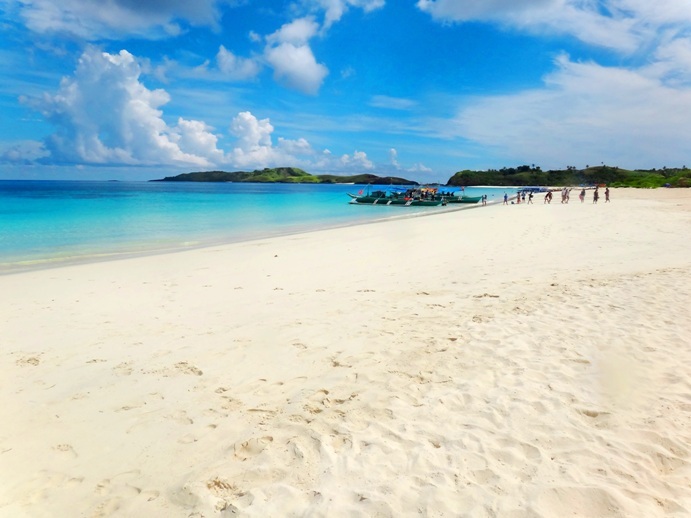 I have been to Calaguas four times, once every year starting 2010. I saw how it’s changing. Although Anawangin’s quality is nowhere near what Calaguas offers, it hopefully would not suffer the same fate as this now overly-exploited cove in Zambales. Calaguas’ fine sands and pristine waters still would not rival any beach I ever saw in the Philippines (Luzon and Visayas beaches only, never been to Mindanao yet). This is my favorite stretch of virgin paradise, and it is saddening what seems to be happening to it now. Let me add something that might contribute to the fear of many: the last time I have been there (April, 2013), I discovered that at the left side of the beach (near the small hill), there’s now these row of cottages supposedly owned by a Boracay resort developer. If that isn’t a portent of things to come, I don’t know what it is. I didn’t know those cottages were owned by a Boracay resort developer! *facepalm* So that’s why! 😦 Thanks for that info. This is really sad. To go through all the long and painful commute just to party—that I don’t really understand. that photo of the corals. 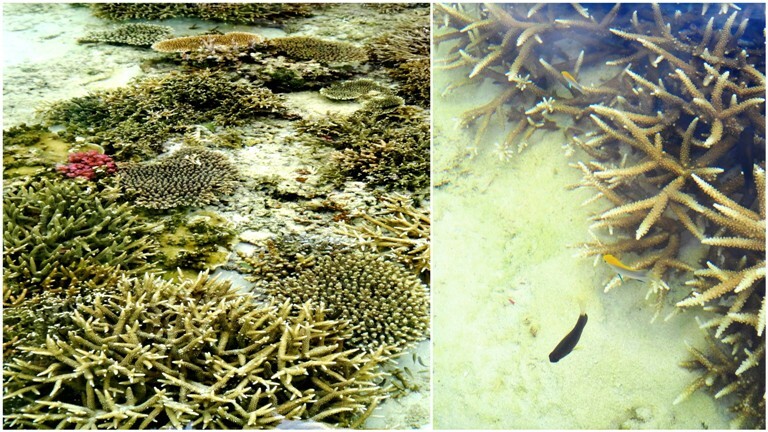 its sad- that massive coral bleaching. it means death to the corals and the fishes that live in it. ohhhh.. that mobile bar, i hope they stop. I didn’t notice the corals were bleaching already. They looked colorful during my visit. Though the tourists I saw taking photos of the corals did not touch them, I saw one person (not sure if he is a local or a tourist) walking over the corals. I called after him, but he just kept walking off to the sea. there’s no more mobile bar when we were there last April 1-4, 2017, only a boat with music and karaoke only, still there are fire dancers to entertain the tourist. Good to know re: mobile bar. I think it’s the tour operators who bring the bar with them. Hopefully that practice has indeed stopped already. I suggest you go on a weekday if you want to avoid the parties, Marj. 🙂 Also, Calaguas is still relatively quiet at daytime. A vast area of corals are indeed bleached. Blame it to cyanide fishing done by the locals of Mangcawayan. There is a local who acts as a middleman/financier them and he even have holding ponds at the back of his house. His house is near the Bgy. basketball court. There was this 2 kilo live grouper dizzily swimming about when I was there two weeks ago. Oh no! 😦 Thanks for this info, Henry. Yes, I know. 😦 She’s your top beach, right? I was partly inspired by your blog posts to go to Calaguas. Well, will just have to go there on a weekday should I return. I hope the barangay officials take the matters I raised with Kagawad Raul to heart. I feel the same 😦 I want to castigate that mobile bar operator to pieces, honestly. When we were there 2 years ago, that sorry excuse of a mobile bar is already there. Nakaka-lungkot na nakaka-inis! I know I feel exactly like Juanderkid. And the rumor back then was that a Boracay operator bought that piece of land in the center. I was secretly hoping his venture will not be successful because of the long travel to the place.Mas lalong nakaka-inis because now they have constructed cottages???!!! Yes, kulang nga sa pangil ang barangay. Based on my informal interview with the kagawad, they are aware of some of the parties but are clueless of the consequences. The kagawad apologized profusely, though, when I said a firecracker landed on the shore and could have harmed people there. “Baka nasusuhulan lang kaya they allowed anything.” –> I can’t really say this is not happening, but my impression is more that they let outsiders walk all over them. Yes, they need to assert themselves more. Do you know that the operator of that bar has an official statement about his feeling that he is being targeted? If you read it, parang gusto mo siyang tirisin. grrr…the gall! E taga-doon pa anamn talaga siya. Really? Where can I read it? ito ba si Melvic Brinas na taga Daet? di marunong makinig yang taong yan. puro pera ang nasa utak. and yes may official statement siya sa mga reklamo about his bs business. the mobile bar is very very disturbing!!! Sadly, places like these will never be maintained as virginal. Every footstep made on a mountain trail, and every grain of sand displaced by humans on a beach steadily contributes to the degradation of these spots. The purist in me cringes every time I see publicity about places I used to/still consider pristine. Newspaper adverts about Mt. Pulag, blog posts about Calaguas, Facebook albums showing the used to be beautiful Anawangin, for-profit tours to Padre Burgos; all of these contribute to the gradual degradation, commercialization, and development of these places of “raw beauty”. A younger, more ideal me, used to never reveal the exact locations of my travels. I would “share” these places only to a select handful of close friends. Selfish as it may sound, I thought it was a way of protecting the destinations. The tourist in me, however, gets excited everytime I hear of a place that sounds new, or I stumble upon some blog documenting a recently “discovered” location. I used to be more motivated to visit places if there were less articles that could be Googled about them. 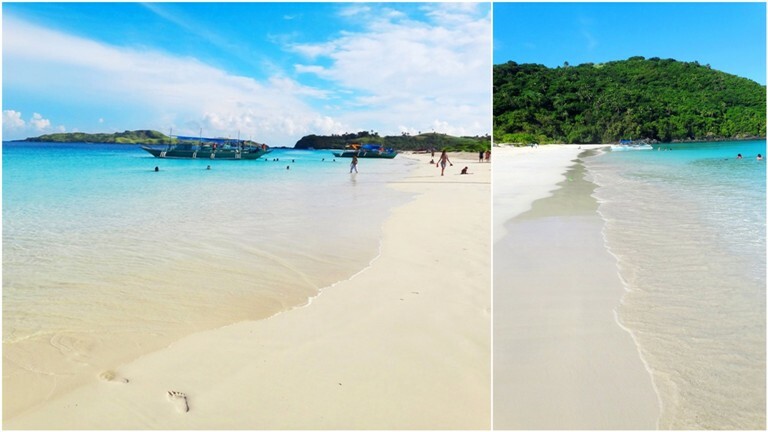 While I have my doubts that Calaguas will be the next Boracay (due to the hassle of getting there, plus the small window of time during when the sea trip is safe), I am afraid that the tourist side of people will overpower their purist side. Personally, I would actually rather have Calaguas developed but maintained, rather than raw but spoiled. 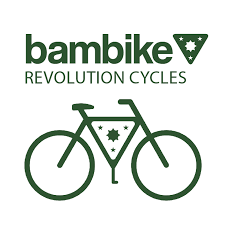 The mobile bars, the pay-for-stay on private land, are but a natural economic reaction. There will be no stopping those. We created the demand, and they fill it. It’s what’s left behind after all the visitors are gone that concern me. Not just the trash, mind you, it’s the perception of the locals as well. Would the private land owners/local government have a strategy to for sustainable tourism? So what are we, the travelers, the bloggers, the trip organizers, with our different motivations and ideologies, to do? That’s another open ended question. Hopefully our individual answers would help keep Calaguas, and other sites sustainable. Well-said, Migs. Personally, I concede to development as long as 1) it gives the locals a sustainable livelihood or income for their community 2) it is environmentally conscious. Sadly, Calaguas has problems with both.